Ahh, the age old question, what should I wear to my session? Since what to wear is always the most stressful part of the session planning, I put this guide or cheat sheet together to help ease your mind a bit and help you make your choices. Let’s start with a good foundation, color schemes. 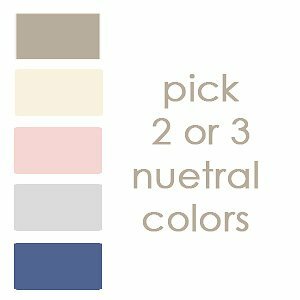 I tell mom’s to think in neutral tones, tans, creams, greys, browns, and blues. These colors are soft and keep the focus on the subjects rather than the clothes. They are also timeless and classic which will ensure that your images don’t look out of date. I personally prefer that you don’t do the whole matchy matchy thing. (Remember when everyone wore white shirts and tan pants or jeans….so outdated!) 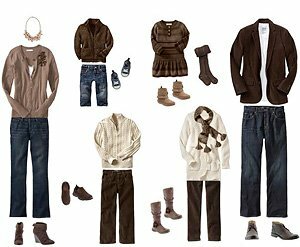 Instead, choose 2 or 3 of the neutral colors mentioned above and mix and match pieces in those tones on everyone. Keep in mind, prints are okay, if they are small and not overwhelming, but super busy crazy prints can be very distracting and take away from the focus, just in the same way bright colors do. Also, play with textures, consider denim, corduroy, and chunky knits – such as sweaters, scarves or hats also in neutral tones, as they all help add interest. Now that we’ve covered the basics let’s get started. First, choose your outfit, yes you! This is SUPER important. I find that it is always the hardest to get the moms outfits sorted out. Cruise through your closet and pull out an outfit that fits you well, is comfortable and makes you feel pretty. I’m sure you’ve heard the saying, “If momma ain’t happy, no one’s happy.” right? So if you are happy and comfortable, everyone else will be too. Last pull from the kids clothes. Grab clothes for them that coordinate but aren’t matchy – matchy. If you are struggling to find a shirt or something it’s always easiest and cheapest to buy one piece for them, rather then buying stuff for you or your hubs. If you do need to shop for a few pieces, check out places like Target, Old Navy or Gap.